Energy acquisition has been important in ecological and evolutionary theory to predict the survival and fitness of individuals and species. Energy acquisition is affected by prey density and behavior, as well as an individual's ability to detect, capture, and consume the prey (Figure 1). These foraging abilities are shaped by both morphological and behavioral traits, which generally reflect genetic and environmental influences. 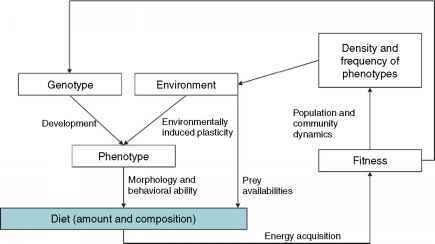 To the extent that morphological or behavioral variation leads to different rates of energy income, these phenotypic traits will be subject to natural selection. Evolution of foraging traits will then influence the structure of ecological communities through changing predator-prey dynamics. Consequently, a major goal in evolution and ecology research has been to understand the mechanisms that determine patterns of resource use. In particular, researchers have tried to explain why species are generalists (using a diverse set of resources) or specialists, and why they use particular subsets of available resources. The resulting 'niche theory' was a major focus of ecology from the 1960s through the 1980s, during which period ecologists tended to view the niche as a property of a species or a population as a whole. 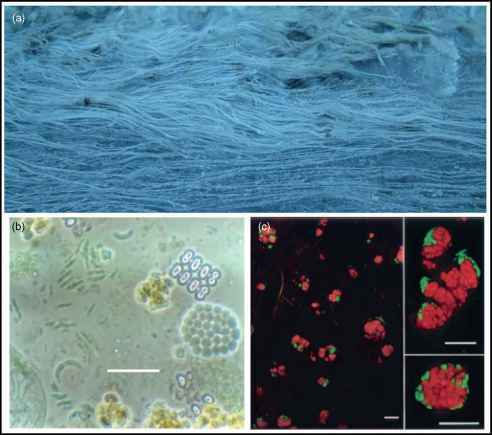 However, to understand niche evolution, we must think of the niche instead as a property of individuals, based on heritable variation in foraging traits. Many animal populations with generalized diets actually consist of individuals specializing on a small subset of the population's diet. In some cases, such diet variation among individuals may exceed differences between distinct species. Within-population diet variation can be related to phenotypic variation, including sexual dimorphism, ontogenetic niches, or related to morphological or behavioral variation in the population. Figure 1 Possible scenarios for how individual diets are determined and how it will feed back on ecological and evolutionary dynamics.